The study of the inner meanings of words and the creative power of the letters is the heart of the Jewish esoteric tradition, the Kabbalah. 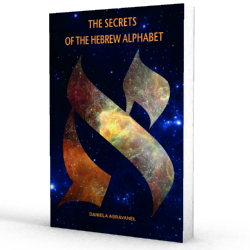 The Jewish Oral Tradition teaches that the 22 letters of the Hebrew alphabet are vessels that channel God’s powerful spiritual energy for creating the world. In other words, God created the world with the letters of the Hebrew alphabet, which were pronounced within 10 statements, in order to create all of existence: time, space, light, stars: “Let there be light, and there was light… ; Let there be a firmament in the midst of the waters… ; Let there be lights in the firmament…” These letters are the “bricks” of creation that translate Divine will into reality. However, the creation process did not only occur in the past. God is continually creating and thereby intimately involved with the world every moment. Daniela Abravanel graduated with a degree in philosophy, and also holds a masters in counseling. She studied the Kabbalah for 15 years in Israel with the greatest rabbis and scholars of Jewish mysticism. She has published various books in Italian on the subject of the Kabbalah. Abravanel also conducts research in the field of psychosomatics and Traditional Chinese medicine. She is completing a PhD in Depth Psychology in California where she presently lives. She also holds healing workshops in Italy, Mexico, and Israel where she travels every year.